Marginal rate of substitution is a tool of indifference curve analysis. Indifference curve shows that when a consumer gets one more unit of the commodity on horizontal axis his total satisfaction is increased. He can maintain his satisfaction at the same level, by sacrificing some units of the commodity on the vertical axis. A consumer can get one unit of commodity X by giving up five units of commodity Y and maintains his satisfaction at the same level. It means one units of commodity X is the marginal rate of . substitution for five units of commodity Y. In fact marginal rate of substitution is the rate of exchange between some units of goods X and Y that are equally preferred. The marginal rate of substitution of X for Y is the amount of Y that will be given up for obtaining each additional unit of X. Professor BILAS says that the marginal rate of substitution of X for Y is defined as the amount of Y the consumer is just willing to give up to get one more unit of X and maintains the same level of satisfaction. The marginal rate of substitution can be explained with the help of a table. The table shows that all combinations provide same satisfaction to consumer. 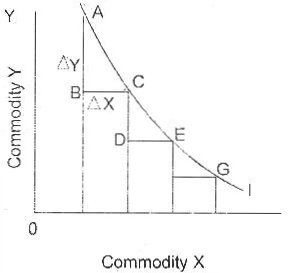 When he chooses combination ‘A’, he can get one unit of commodity X and 30 units of commodity Y. In combination ‘B’ he can get 2 units of commodity X and 22 units of commodity Y. The marginal rate of substitution in this case is 1:8. If the consumer chooses combination ‘C’ he can get 3 units of commodity X and 16 units of commodity Y. The marginal rate of substitution in this combination is 1:6. The marginal rate of substitution decreases in successive combinations. The consumer sacrifices smaller and smaller amount of commodity Y for every additional unit of commodity X. This behavior of the consumer is called principle of diminishing marginal rate of substitution. The slope of indifference curve measures the marginal rate of substitution. It is negative and falling from left down to the right that shows the law of diminishing marginal rate of substitution. The marginal rate of substitution diminishes because (1) each particular want is satiable and (2) goods are not perfect substitutes of one another. When wants are satiable a consumer obtains more and more of one commodity and ultimately his demand goes on decreasing. Consumer is ready to sacrifice less amount of other commodity to get more of this commodity. When goods are not perfect substitutes the marginal rate of substitution of one for the other must decrease.